Thanks to a good foodie friend, I was able to sample each one of these delicious snacks in all of their healthy and tasty glory. 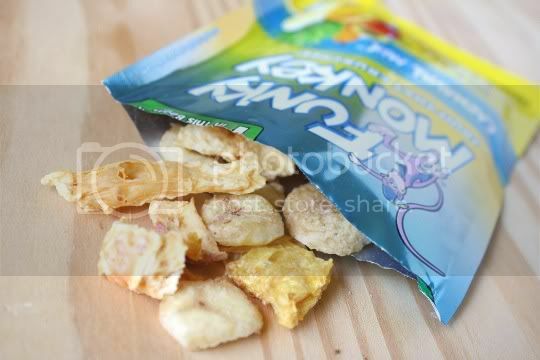 Unlike regular dried fruit--which, believe it or not, is usually packed with extra sugar and preservatives--Funky Monkey is completely au naturel. The freeze-drying process allows the fruit to retain more of its nutrients, while being completely free of any artificial additives. 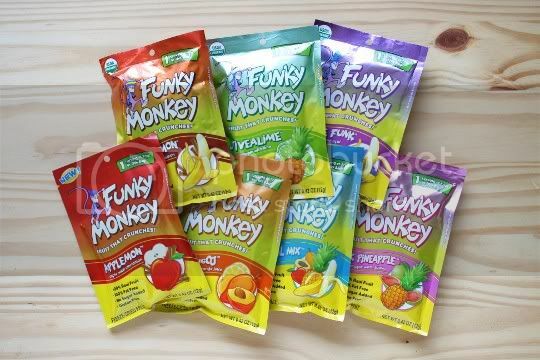 Funky Monkey seems to be making its way onto more and more grocery store shelves. That's right, you don't need to hit up any of the fancy stores for these one-of-a-kind treats. The 1-oz. bags (which contain an entire THREE servings of fruit, by the way) retail for about $2-2.50, while the smaller bags (equivalent to one serving of fruit) are about $1-1.25. The smaller bags, pictured in this post, yielded about two or three mouthfuls of crunchy goodness. Trust me, go for the bigger bag. If you've never had freeze-dried fruit before, its appearance doesn't leave a lot to be desired. It's shriveled, thin, and hard, unlike the plump chewiness of dried fruit. 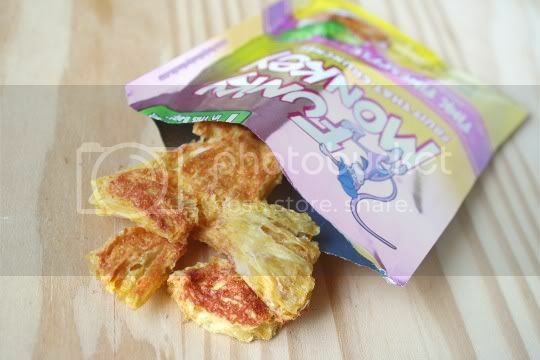 However, where else can you find such an amazing crunch?! 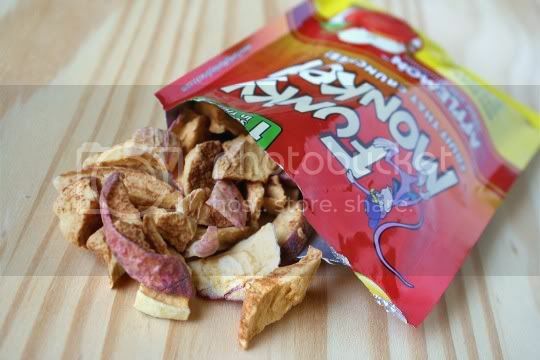 Each piece is like eating light, crunchy, potato-chip-fruit-candy...the PERFECT thing for snacking! A great way to start off your freeze-dried fruit experience, this pack was by far my favorite. It's crazy how something so simple as apples and cinnamon (yes, those are they only two ingredients) can taste so amazing! I'm convinced that freeze-drying brings out the flavor in fruit even moreso than eating it raw, as each tiny chip is absolutely packed with tanginess, sweetness, and cinnamon. This was probably my second favorite flavor, which is funny because I'm not very fond of bananas in their raw form. Again, the tanginess in each piece surprised me: since when are bananas tangy? 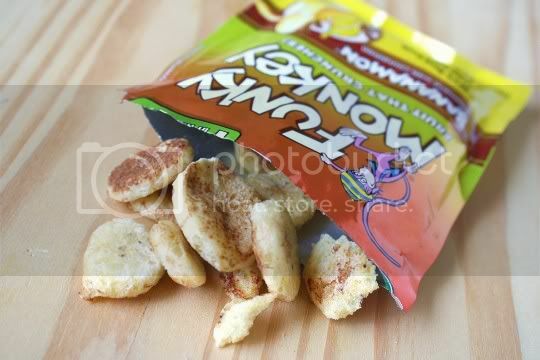 These tasted as if they'd been tossed in lime juice, yet the only other flavoring is cinnamon. 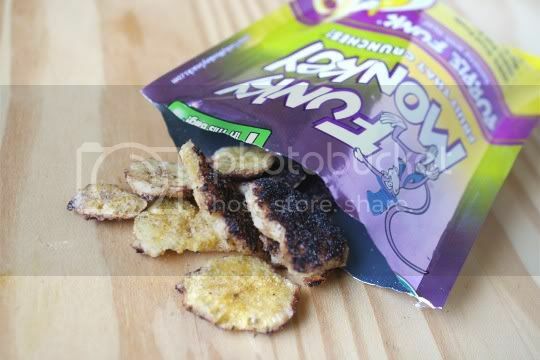 Super flavorful, light, crunchy...better than any banana chip you've ever had! Naturally, you'd expect mango and orange to be tangy, and this is no exception. Each piece is tart and orangey, with the perfect balance of both mango and orange flavors. If you're looking for a sweet-tart, almost mouth-puckering snack, this will do quite nicely. 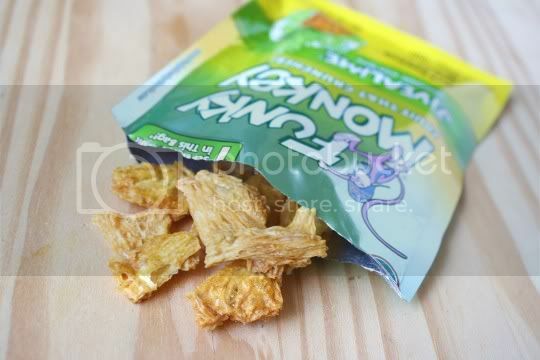 Freeze-dried pineapple and lime juice, another tart crunchy variety of Funky Monkey. However, this wasn't the lightest-textured one. The pineapple retains some of its stringiness, making it a little thick and hard to chew (and be careful, this stuff gets stuck in your teeth). Still, this citrus-packed variety is delicious and addictive. 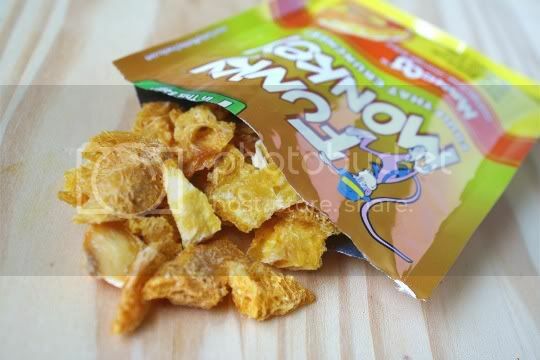 The only Funky Monkey snack to be a true mix of various fruits, containing pineapple, banana, apple, and papaya...and it's that papaya that's gonna make you a lover or hater. I'm not the biggest fan of papaya (in any form), as I think it has a strange acrid mustiness. Unfortunately, I think this overwhelms everything else in the bag, making the other fruits slightly bitter. This had virtually no tanginess compared to the other varieties, and I'm definitely going with this being my least favorite. Another love-or-hate fruit is the star of this one: the trendy acai berry. Personally, I think acai tastes like a mix between a bitter blueberry and overripe raspberry. It's not the greatest, but it definitely takes the forefront here. The strange deep purple, almost black acai coats one side of each banana piece, and in fact, you can't taste much of the banana. I could see myself liking this after a while (the light and airy crunch certainly helps), so I suppose this one's for acquired tastes. I thought for sure the Carnaval Mix would be the most tropical of the bunch, but it's this actually one. I am in love with anything guava, so this was an automatic winner for me. Pineapple pieces are coated with a reddish-pink guava tinge, creating a tart and tangy flavor similar to JiveALime (except this one has more of a tropical feel). I'd rank this as my third favorite to round out the top three. Start your new year off right, with an even healthier version of your favorite snack. Just remember, everything in moderation...because it would be quite easy to polish off more than one bag at a time! Freeze-dried fruit FTW!!! As long as it's healthy and nutritious, then it's a good snack. Choose the right option when it comes to your health.